Sickled erythrocytes (SEry) on peripheral blood smear (PBS) followed by positive sickling or solubility test are commonly used as a screening test, while hemoglobin (Hb) electrophoresis or high-performance liquid chromatography (HPLC) confirms the diagnosis of sickle cell disease (SCD). SEry in urine have been rarely reported so far.,,, We report an interesting case of a patient with normal hemogram and red blood cell (RBC) morphology on PBS. It was the finding of SEry on urine microscopy which served as the first clue to the diagnosis of sickle cell trait (SCT) which was then confirmed by HPLC. A 15-year-old female presented with an episode of generalized tonic clonic seizure and altered sensorium since 1 day followed by regain of consciousness without any focal neurological deficit. She also gave a history of headache and sore throat 1 week back. Noncontrast computed tomography head, serum electrolytes (sodium 137 mEq/L, potassium 4.6 mEq/L), kidney function test (blood urea 12 mg/dL, serum creatinine 0.2 mg/dL), and liver function test (serum bilirubin 0.6 mg/dL) were within normal limits. One day later, gross hematuria was noted by the resident doctor in urine collected in the catheter bag. She did not give any past history of hematuria and has been healthy without any significant medical history. Her family history was also negative with respect to any neurological, renal, or hematological disorders. Her hemogram was normal (Hb 13.1 g/dL, RBC count 4.72 × 106/μL, hematocrit 39.3%, total leucocyte count 8,010/μL, platelet count 191,000/μL) with normocytic normochromic RBCs on PBS. The urine sample received was 20 mL in volume, red in color, with a pH of 6. Chemical examination of urine using dipstick testing showed presence of traces of albumin, whereas glucose, ketone bodies, bile pigments, and urobilinogen were absent. 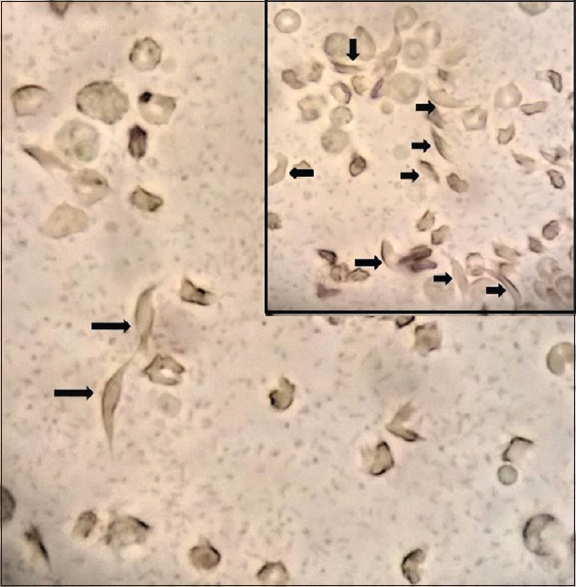 Urine microscopy revealed 10–15 pus cells, 3–4 epithelial cells, and 20–25 RBC per high power field. Fair number of the RBCs were sickle-shaped [Figure 1]. HPLC performed after urinary findings showed HbF 4.4%, HbA 54.6%, HbA22.1%, HbD 0%, and HbS 38.9%. On the basis of laboratory findings, final diagnosis of hematuria associated with SCT (Hb-AS) was given and the patient was managed conservatively. Worldwide prevalence of SCT is 5% with a higher prevalence in India ranging from 1% to 40% among different tribal groups. This is because of practice of consanguineous marriage making individuals prone to genetic disorders. The highest prevalence has been reported from tribes of south Gujarat, Maharashtra, Chhattisgarh, Odisha, and Madhya Pradesh. It is very important to detect these carriers to prevent the birth of a child with homozygous sickle cell anemia (SCA), sickle-β-thalassemia, or HbSD thalassemia which present with severe disease. Preventing the birth of affected children through population/targeted screening and genetic counseling is the best possible strategy for prevention of these disorders. SCT patients have normal hemogram and RBC morphology on PBS. Sickling, solubility test, and HPLC have been used as a screening test to identify SCT in different parts of the country. Identification of sickle cells in urine is a simple, noninvasive, and cost-effective technique to identify patients with SCD and it can serve as a useful adjunct to the existing screening methods. Hematuria is by far the most common complications of SCT. It is far more common in heterozygotes than in homozygotes as SCT is 30–40 times more frequent than SCA. Sickling of erythrocytes within the hypoxic, hypertonic, and acidotic environment of renal medulla followed by stasis within the peritubular capillaries with extravasation of RBCs into the tubular lumina is the possible initiating mechanism of hematuria. The finding of SEry in urine of our patient was the initial clue to the diagnosis of SCD. Sickle cells in urine have been described in the urinary sediment of 10 patients with SCD/SCT with either gross or microscopic hematuria so far.,,, However, it is only in three of these cases that the potential diagnostic role of these cells was considered ,, [Table 1]. The observations of this case are clinically very important in a country like India with such high prevalence of SCD among specific population groups who are unaware, have their own cultural and social systems, and where delivering healthcare is a challenge. Poor facilities for diagnosis, genetic counseling, and prenatal detection add to the burden. With high percentage of patients with SCT exhibiting hematuria, finding sickled RBCs in urine would serve as a simple, quick, low-cost screening method of identifying these cases. Although it cannot be used for screening in population-based programs, SEry in urine if found should never be ignored, as they could be the only clue to the diagnosis of an unsuspected case of SCD. Fogazzi GB, Leong SO, Cameron JS. Don't forget sickled cells in the urine when investigating a patient for haematuria. Nephrol Dial Transplant 1996;11:723-5. Srivastava S, Srivastava R, Ghorpade KG. Sickled erythrocytes in urine as a clue to the diagnosis of sickle cell trait. Saudi J Kidney Dis Transpl 2017;28:909-11. Tesser Poloni JA, Bosan IB, Garigali G, Fogazzi GB. Urinary red blood cells: Not only glomerular or nonglomerular. Nephron Clin Pract 2012;120:c36-41. Savige JA, Birch DF, Fairley KF. Haematuria associated with ureaplasma infection in sickle-cell trait. Aust N Z J Med 1982;12:293-5. Colah RB, Mukherjee MB, Martin S, Ghosh K. Sickle cell disease in tribal populations in India. Indian J Med Res 2015;141:509-15.